I don’t think I ever have been more photographed in my life. Everyone we passed were waving at us, smiling. Many of them taking pictures. When we stopped at a red light parents would run out into the street with their kids, put them down next to us. Run back to take a picture, then run to get their kids. We were waving left and right, posing for pictures. Trying to keep up with traffic. When I showed my friend the YouTube video from Tokyo, showed him what amazing things you could do there, he immediately booked tickets for Japan himself. He could only stay six days, arrived almost two days before me, and his last two days I would go to Okinawa. We only had two days together in Tokyo. Not a lot of time, but more than enough to do what he really wanted to do. We would try Super Mario Kart in Tokyo. We met outside Shibuya Station on sunday morning. We had booked for us to go at 12, me met at 11 am. More than enough time to get to there. We took the Yamanote Line from Shibuya to Akihabara. It was only a short walk from the station. The instructions on how to get there we had received in advance were really good, we found the place immediately. You can find everything in Tokyo, and it seems you can do anything too. There is an old saying ‘If you can’t find it for sale in Tokyo, you can’t find it for sale anywhere’. 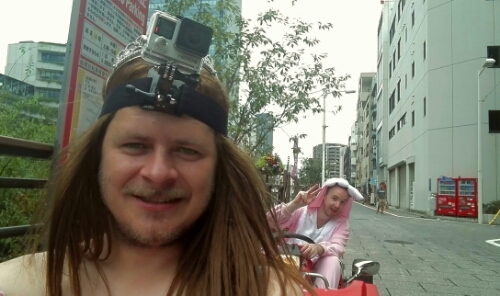 What we had found to do this time was Cosplay GoKarting on the streets of Tokyo. Rent a gokart for whatever time you like, rent a guide if you want, and you will be provided with costumes to dress up in. Super Mario costumes are very popular, it is like real life Super Mario kart in Tokyo. The cars are licensed to drive on city roads. The website of the company we rented from boasted that some of their clients drove from Tokyo to Nagoya and back, a journey of around 700 kilometers. The first costume I saw was Princess Peach. Why not, I thought. 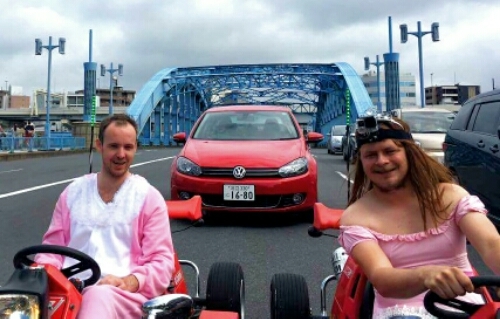 Driving around Tokyo in a gokart dressed as a princess is not something you do every day. My friend followed suit and chose a pink bunny costume. We got dressed, got a quick instruction on how to operate the gokart, before the guide took us out on the streets. He driving first, the two of us following, sometime struggling to keep up. The karts have a maximum speed of 60 km/h, our guide liked to push the karts to the limit. We drove from Akihabara towards Ueno, an area I know quite well. Not long after we started we drove past The World End, my favorite bar in Japan. A place I always visit when in Tokyo. From there we followed the main road towards Asakusa. This is where we really pushed the kart to the limit. All the time people were waving at ut, pointing us out to their kids. Smiling at us. And probably laughing at us as well. People would lean out of car windows and wave at us. Drivers took pictures of us when we stopped for a red light. This is how it feels like to be a celebrity I guess. After Asakusa we drove toward Tokyo Skytree, the highest tower in the world, with a viewing platform at 450 meters. The last few minutes driving up to the Skytree it had started raining, just a few drops for now, but it seemed as if the rain was picking up. Our guide pulled over his kart outside a cafe just opposite the Skytree, told us the rain should be over in ten minutes. Why not grab a coffee and wait it out. One coffee and exactly ten minutes later it stopped raining. We got in our cars and set off. Driving to Tokyo Skytree had taken 50 minutes. We only had an hour left of our ride. It was time to head back. We followed more or less the same roads back to Akihabara. A few times our guide deviated from our previous route but we soon were back on familiar roads. When nearing Akihabara we stopped at a gas station to fill up the karts’ tanks and go to the toilet to empty our tanks. A few minutes later we pulled up outside the GoKart rental company, got out of our cars and costumes. Our ride was over. It had been great. 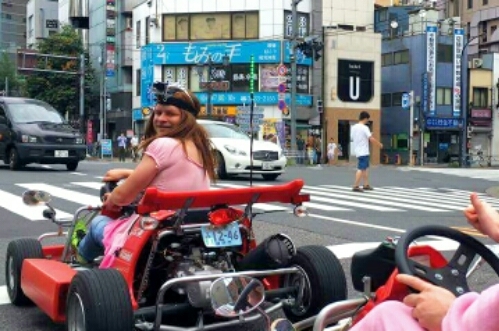 There are several companies offering the chance to rent a gokart through the streets of Tokyo. A quick google search for ‘Super Mario kart in Tokyo’ will bring up many options. We used www.govoyagin.com and were very satisfied. Karts can be rented for one or more hours, we rented the karts for two hours, and you can rent a guide to drive with you if you want. This is definitely something I recommend doing if you are in Tokyo. This entry was posted in Japan and tagged gokart, sightseeing, Super Mario, tokyo on April 3, 2017 by Traveltorgeir. 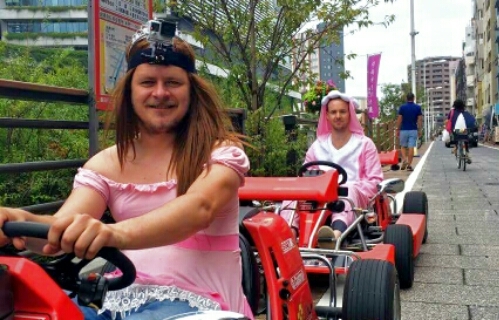 If there is a place where you can go for Cosplay GoKarting it had to be Tokyo! I wonder how many guys have the courage to do the tour dressed as Princess Peach, though? LOL Well, if you’re going to do it, it better be memorable. I wonder what the kids whose parents took pictures with you will think in a few years when they grow older. It sure is a story! I’m sure you all created a stir go-karting in costume in Tokyo. Tokyo might be one of the few cities you can get away with that! I enjoyed reading your article. I was laughing a bit also especially when you felt like a celebrity. This was definitely a fun idea! You can only do this in Japan. This is what traveling is all about! You and your friend had a blast! I would love to do this in the future in Japan too. I love Mario Kart, I grew up playing it and still play it on the Wii U. I would have dressed as Wario though I think! I don’t think I’ve done anything as crazy as this in my life! Good work! The super Mario cart sounds so much fun. Japan seems like a fun country. I have never beeen to japan but I am already attracted to its quirks etc. It was very fun. You should go to Japan. Great country! This is so cool. I had no idea anything like this existed! I’m sure I would be one of those people snapping tons of photos of you in your gokart… unless I was in a kart too! Seems like a great way to see the city. I’ll have to keep this in mind for a future trip! Ok. You guys are totally crazy!!! Lolz! Would I do something like this? Perhaps not! But dressing up as a princess and go karting all over the city is definitely crazy! Btw, you should youtube again, someone might have shot & uploaded a video of your feat!!! This looks like the best thing ever. I love your dress. It’s so pretty and totally matches your GoPro!! Oh my word how did I not know this existed?! ?